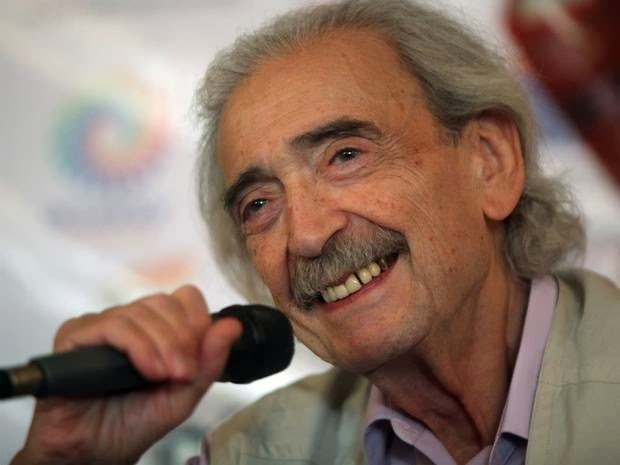 Juan Gelman, the renowned Argentine poet and left-wing activist who was awarded the prestigious Cervantes Prize died in Mexico on 15th January. He was 83. Juan Gelman was one of the most brilliant writers in Spanish of the 20th century. "Gelman worked with words like they were plastic, he modeled them," says writer Vicente Muleiro. Gelman has poetry "tattooed in his bones”, echoed by the Culture Minister César Antonio Molina when he was awarded the Cervantes prize. Born in Buenos Aires in 1930 to Jewish Ukrainian emigrants – his father took part in the 1905 Russian Revolution – Gelman fell in love with poetry at the age of seven on hearing his brother Boris recite verses by Pushkin in Russian, even though he could not speak the language. His first verses were as a love-struck nine-year-old: "she was called Ana", he would later recall. He passed off and sent her poems by another author as his own, then wrote his own. Neither tactic conquered Ana, but his vocation was found. His mother initially opposed Gelman's plan to become a poet, but combined with journalism it was a decision that proved to be the right one. From 1956 onwards he published more than 20 books of poetry, translated into 14 languages, winning the Cervantes Prize, the most prestigious literary award for work in Spanish, in 2007, along with the Juan Rulfo, Pablo Neruda and Queen Sofia poetry prizes. As for his journalism's relation to his poetry, he said, "they're like good neighbours who live on different floors in the same block of flats." By March 1976, when Isabel Peron was deposed by a military coup, some 5,000 of the Montoneros were in jail. Gelman narrowly avoided arrest that July, but in his absence the police arrested his daughter Nora Eva, his son Marcelo and pregnant daughter-in-law Maria – 20 and 18 respectively at the time – and took them to a clandestine detention centre. Nora Eva was released after three days, but the other two were not so lucky. Repeatedly tortured over four months, Marcelo was the first to die, shot in the head and his remains dumped in an oil drum filled with cement and thrown in a river. Maria gave birth, and lived for another two months before she was also killed – Gelman suspected in a barracks in Uruguay as part of the Operation Condor agreement between South American military dictatorships for wiping out left-wing "subversive" activity. Her child Macarena, meanwhile, was handed over to foster parents, a Uruguayan police chief and his wife, and a new birth certificate created for her bearing their name. After tracking down the remains of his son in 1990, Gelman began a search for Macarena and in 1999 she was located. In 2000 he and his granddaughter were reunited, and in 2005 a Uruguayan judge granted Macarena the right to regain her real parents' surnames. "In this way," as Gelman said at the time, "my son and my daughter-in-law continue in her and in some way, we all continue." "I died many times, and with each report of a murdered or disappeared friend, the pain of those lost became greater," he said during his acceptance speech of the Cervantes prize in 2008. In one of his last interviews, with the Spanish paper El Pais, Gelman uttered dire warnings of "the development of a whole system to shred our very own spirit: the worst thing that can happen to the human being is a kind of docile acceptance: of terrorism, of genocide through hunger, of the lack of education in the world." He added, "Something will change, but I won't be alive to see it." I loved the below poem for its honesty. It is amazing to see how the reordering of the lines of the first stanza in the last one gives an assertion to the profession of poetry.